In a small upstate New York town, an idyllic lake yields a ghastly discovery when the skeletal remains of a young woman missing for twenty-seven years are pulled from the icy depths—along with unmistakable evidence of her murder. Suddenly, the long-dormant case of Kelly McShane Braden’s mysterious disappearance is reactivated. And for two devastated men, dark emotions and disturbing secrets will also rise to the surface. Yet Mark isn’t the only one with Kelly’s murder on his mind. Dr. Earl Garnet, chief of staff at Buffalo’s St. Paul’s Hospital, was once Kelly’s secret lover . . . and would-be savior. Until his plans to rescue her from an abusive marriage were cut short by her vanishing. Now, as the last person to see Kelly alive, he’s in danger of becoming the prime suspect, unless he can unmask the murderer first. But neither man knows about the twisted chain of lies and corruption that led to Kelly’s death—or the shocking revelations that were meant to go with her to a watery grave. And the harder they push for answers, the easier they make it for their lethal quarry to zero in on them—and push back with deadly force. With Mortal Remains, Peter Clement remains in total control of readers’ nerves from the very first page, once more wielding heart-racing suspense and scalpel-sharp terror with a master surgeon’s skill. Peter Clement, M.D., is a physician who headed an emergency room at a major metropolitan hospital. He is also the author of Critical Condition, Mutant, The Procedure, Death Rounds, and Lethal Practice. He is married to a physician and has two sons. 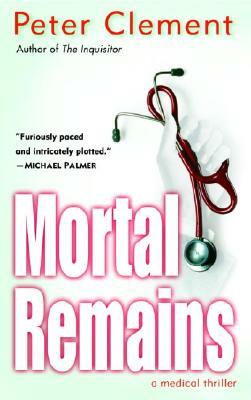 “Peter Clement’s Mortal Remains is furiously paced and intricately plotted. I really cared about these characters and what happens to them. There is no higher praise I can give to anyone’s writing."